ABUJA, Nigeria, August 5, 2011 (ENS) – Pollution from over 50 years of oil operations in the Ogoniland region of Nigeria is poisoning communities by contaminating their air, land and drinking water, an in-depth scientific assessment by the United Nations Environment Programme reveals. Conducted at the request of the Nigerian government, the UNEP report blames both the government and Royal Dutch Shell for neglect of this Niger Delta region. The report estimates that at least US$1 billion [N150 billion] is needed over the first five years to start the world’s largest oil clean-up in Ogoniland. 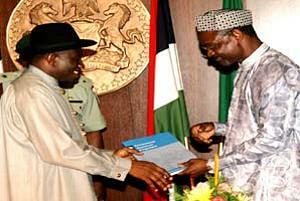 UNEP presented its report Thursday to Nigerian President Goodluck Jonathan in the capital Abuja. Describing the environmental challenges in Nigeria as “severe,” President Jonathan said Nigeria should receive UN assistance in checking environmental problems in the country, especially in the Niger Delta region. President Jonathan said Nigeria has paid its UN dues in all terms and has participated in peacekeeping in Africa and the rest of the world and so deserves support for the cleanup of Ogoniland. “If the United Nations can intervene in places where there are civil wars, then environmental pollution calls for its attention,” he said. In at least 10 Ogoni communities where drinking water is contaminated with high levels of hydrocarbons, public health is seriously threatened, according to the UNEP assessment. In one community, at Nisisioken Ogale, in western Ogoniland, people are drinking water from wells tainted with benzene, a known carcinogen, at levels 900 times above World Health Organization guidelines. The site is close to a Nigerian National Petroleum Company pipeline. UNEP scientists found an eight cm (three inch) layer of refined oil floating on the groundwater which serves the wells. This was linked to an oil spill that occurred more than six years ago. 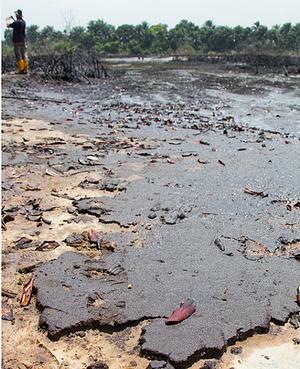 While the report provides operational recommendations for addressing the widespread oil pollution across Ogoniland, UNEP recommends that the contamination in Nisisioken Ogale warrants emergency action ahead of all other remediation efforts. While some results could be immediate, the report estimates that countering and cleaning up the pollution and catalyzing a sustainable recovery of Ogoniland could take 25 to 30 years. The UNEP report finds that environmental restoration could take 30 years as the pollution has destroyed the communities’ fishing environment due to the lack of maintenance of oilfield infrastructure, which has created public health and safety issues. UNEP says this work will require the deployment of modern technology to clean up contaminated land and water, improved environmental monitoring and regulation and collaborative action between the government, the Ogoni people and the oil industry. Such collaboration would be a reversal of history in the Niger Delta. The “painful” history of oil exploration and production in Ogoniland “has put people and politics and the oil industry at loggerheads, rendering a landscape characterized by a lack of trust, paralysis and blame, set against a worsening situation for the communities concerned,” UNEP says in its report. “The Shell Petroleum Development Company’s own procedures have not been applied, creating public health and safety issues,” the report finds. “Oil spills in the Niger Delta are a tragedy, and Shell Petroleum Development Company of Nigeria (SPDC) takes them very seriously. That is why we have always accepted responsibility for paying compensation when they occur as a result of operational failure,” said SPDC Managing Director Mutiu Sunmonu in a statement Thursday. “Even when, as is true in the great majority of cases, spills are caused by illegal activity such as sabotage or theft, we are also committed to cleaning up spilt oil and restoring the surrounding land,” said Sunmonu. 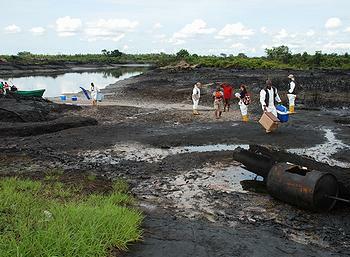 “Concerted effort is needed on the part of the Nigerian government (which itself owns a majority interest in the assets operated by SPDC under a joint operating agreement with the Nigerian state oil company, NNPC), working with oil companies and others, to end the blight of illegal refining and oil theft in the Niger Delta, both of which perpetuate poverty. This is the major cause of the environmental damage,” Sunmonu said. UNEP Executive Director Achim Steiner said the report provides the scientific basis on which a long overdue and concerted environmental restoration of Ogoniland can begin. “The oil industry has been a key sector of the Nigerian economy for over 50 years, but many Nigerians have paid a high price, as this assessment underlines,” Steiner said. Over a 14-month period, the UNEP team examined more than 200 locations, surveyed 122 kilometers (76 miles) of pipeline rights of way, reviewed more than 5,000 medical records and engaged over 23,000 people at local community meetings. Detailed soil and groundwater contamination investigations were conducted at 69 sites, which ranged in size from 1,300 square metres (.3 acres) to 79 hectares (195 acres). Altogether, more than 4,000 samples were analyzed, including water taken from 142 groundwater monitoring wells drilled specifically for the study and soil extracted from 780 boreholes. “It is UNEP’s hope that the findings can break the decades of deadlock in the region and provide the foundation upon which trust can be built and action undertaken to remedy the multiple health and sustainable development issues facing people in Ogoniland,” Steiner said. “In addition it offers a blueprint for how the oil industry and public regulatory authorities might operate more responsibly in Africa and beyond at a time of increasing production and exploration across many parts of the continent,” he said. 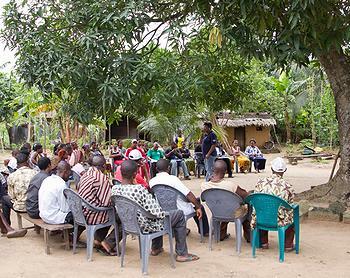 “The cleanup of Ogoniland will not only address a tragic legacy but also represents a major ecological restoration enterprise with potentially multiple positive effects ranging from bringing the various stakeholders together in a single concerted cause to achieving lasting improvements for the Ogoni people,” said Steiner. The report recommends establishing three new institutions in Nigeria to support comprehensive environmental restoration in Ogoniland. A proposed Ogoniland Environmental Restoration Authority would oversee implementation of the study’s recommendations and should be set up during a Transition Phase, which UNEP recommends should begin as soon as possible. The new Authority’s activities should be funded by an Environmental Restoration Fund for Ogoniland, to be set up with an initial capital injection of US$1 billion contributed by the oil industry and the government, to cover the first five years of the clean-up project. UNEP recommends that an Integrated Contaminated Soil Management Centre should be built in Ogoniland. Supported by potentially hundreds of mini treatment centers, it would treat contaminated soil and provide hundreds of job opportunities. The UNEP report also recommends creating a Centre of Excellence in Environmental Restoration in Ogoniland to promote learning and benefit other communities impacted by oil contamination in the Niger Delta and elsewhere in the world. 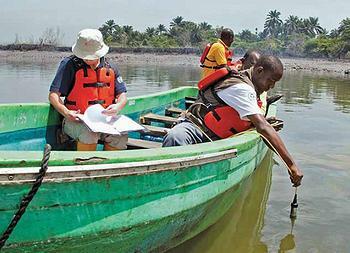 Click here to read the “Environmental Assessment of Ogoniland” report.